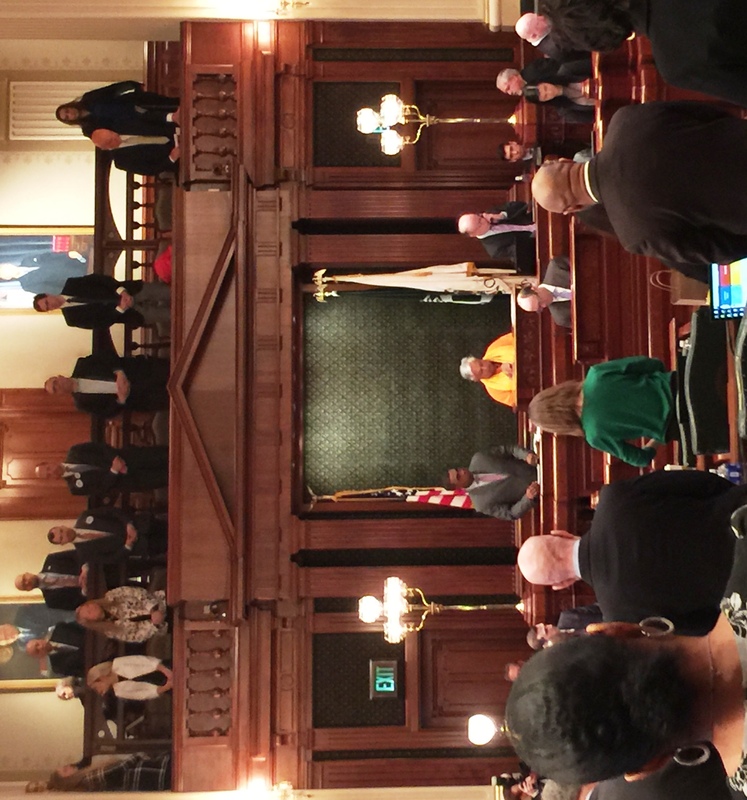 On February 27 and 28 respectively, Illinois State Senate and House of Representatives in Springfield started their sessions with Hindu prayers, containing verses from world’s oldest existing scripture. Distinguished Hindu statesman Rajan Zed delivered the invocations from ancient Sanskrit scriptures before the Senate and House. After Sanskrit delivery, he then read the English interpretation of the prayers. Sanskrit is considered a sacred language in Hinduism and root language of Indo-European languages. Wearing saffron colored attire, a ruddraksh mala (rosary), and traditional sandalpaste tilak (religious mark) on the forehead; Rajan Zed sprinkled few drops of water from river Ganga of India, considered holy by Hindus, before the prayers. Reciting from Brahadaranyakopanishad, Zed said “Asato ma sad gamaya, Tamaso ma jyotir gamaya, Mrtyor mamrtam gamaya”, which he then interpreted as “Lead us from the unreal to the real, Lead us from darkness to light, and Lead us from death to immortality.” Reciting from Bhagavad-Gita, he urged Senators and Representatives to keep the welfare of others always in mind. A reception was hosted for Rajan Zed by the Greater Springfield Interfaith Association, a “community of individuals engaged in ministry from many different faith traditions”. Zed also met Illinois Governor Bruce Rauner and presented him a copy of Bhagavad-Gita. Zed is a global Hindu and interfaith leader, who besides taking up the cause of religion worldwide, has also raised huge voice against the apartheid faced by about 15-million Roma (Gypsies) in Europe. Bestowed with World Interfaith Leader Award; Zed is Senior Fellow and Religious Advisor to Foundation for Religious Diplomacy, Spiritual Advisor to National Association of Interchurch & Interfaith Families, on the Advisory Board of The Interfaith Peace Project, etc. He has been panelist for “On Faith”, a prestigious interactive conversation on religion produced by The Washington Post; and leads a weekly interfaith panel “Faith Forum” in a Gannett publication for over seven years. John J. Cullerton is President of 59-member Illinois Senate, while Michael J. Madigan is Speaker of 118-member Illinois House of Representatives. The name “Illinois” reportedly comes from a Native American word meaning “tribe of superior men”. Known as “Land of Lincoln”, Abraham Lincoln and three other U.S. Presidents have called Illinois home, including Ulysses S. Grant, Ronald Reagan and Barack Obama. Popcorn is the official snack food of Illinois, while Square Dance is its official dance.